You are currently browsing the daily archive for June 1, 2008. One of the fun things about Netflix (and having a ridiculously long queue) is that I’ll receive movies, but have absolutely no clue why I put them on my queue. Such is the case with The Duellists. It was the first film Ridley Scott directed, but that wouldn’t be a reason. It stars Harvey Keitel and Keith Carradine, who are cool, but I don’t think that would be enough. The movie was written by Gerald Vaughn-Hughes, but I’ve never seen anything by him, and it is based on a story by Joseph Conrad, who is cool. The Duellists is about two soldiers in Napoleon’s army who fight a series of duels. Which is kinda badass-sounding. So maybe that did the trick? Anyway, I instantly regretted the pick. I say “instantly”, because for some reason, my DVD player didn’t sync up the sound and video. Making the opening swordfight rather bizarre. Fortunately I had my 360. Or I should say “unfortunately.” Because, wow, what a terrible movie. 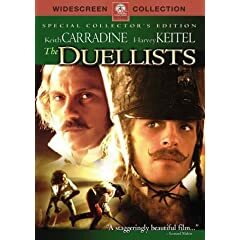 I mentioned that the movie was about Keitel and Carradine dueling, yes? Well, that’s pretty much all there is to the movie. They don’t have a good reason for fighting. They don’t see each other for years, but when they happen upon each other, time for another duel. Sort of like Peter Griffin fighting that chicken. Only worse. In between duels, well, I’m not sure they got around to deciding what would happen between duels. Which was a mistake, in my humble opinion. There’s a few vague subplots involving women, I suppose. But they are beyond thin. And the ending, well, I suppose the fits the rest of the movie. In that it is pointless, unsatisfying, and pretty much stupid. OK, the movie wasn’t entirely bad. The moustaches were pretty amazing. Also, Keitel’s character is the special kind of dementedly driven than only Keitel can conjure. I would not want to be alone in a room with that man. Albert Finney is in the movie. And for a brief second so is the guy who plays Hastings on A&E’s Poirot. So that’s something. Also, someone named Tom Conti who was nominated for a Best Actor Oscar for a movie called Reuben, Reuben. I can’t believe I’m not making that up. The duels themselves are generally awkward, though there’s one that is kinda cool. Please don’t see this movie. Read a book. Play outside. See a different movie. Poke yourself in the eye with a fork. Click here to check out the 2008 Movie Awards Liveblog. Through the magic of Ytic, I saw The Promotion (which comes out this week in limited release) a few weeks ago. If you read the good folks at Cinematical, you’ve seen them hype this movie. Mucho. I quite enjoy their work, but I’m going to have mildly part ways here. The Promotion is a decent enough film, funny and charming at times, but ultimately it is too slight to reach its potential. Seann William Scott and John C. Reilly are assistant store managers at a local chain grocery store fighting over a promotion to store manager at a new branch opening. The movie follows their wacky exploits and politicking as they try to best each other. Fred Armisen is their boss, Jenna Fischer is Scott’s girl and Lili Taylor is Reilly’s wife. Written (and directed) by Steve Conrad (who also wrote The Pursuit of Happyness and The Weather Man), The Promotion seems like it knows it can be funny, it just can’t quite decide the right path to get there, taking a few steps down several different ones, then quickly turning back and starting anew. To wit, we get a few fantasy pops, but only early on. The always awesome Bobby Cannavale shows up as Jenna Fischer’s boss, as a potential foil to Sean William Scott, but then he goes away for the bulk of the movie. Reilly plays a Canadian and Taylor a Scot, so the movie has some fun with their accents, but not to the point of being a running joke. Etcetera. The cast is pretty spot on. John C. Reilly can’t help but be funny. That’s just a truth. Seann William Scott being funny may be less so, but Dude, Where’s My Car? was hilarious. And I think you have to admit Stifler is a pretty great character. I would have liked to see more to the characters of Jenna Fischer and Lili Taylor (though, to be sure, that’s pretty much always the case), something elevating them more from the typical supporting female pillars. I’m more than a bit biased, but I enjoyed all the shots of Chicago. Probably would have liked it to become even more of a character, to be honest. But hey, they did manage to get Rainbow Cone in there. But perhaps the biggest problem with the movie as a whole (other than that the humor only comes in spurts) is with the resolution. Neither Scott nor Reilly end up as sympathetic characters. I found myself not particularly rooting for either one to win the job. And that’s sort of a problem, seeing how the entire movie is two struggling against each other to win the promotion. And the ending, well, I didn’t find it satisfying in the least. So I’d say The Promotion is generally amusing, and it shouldn’t be avoided, but I don’t think it is worth actively seeking out.